There are few things more instantly appealing than a band that manages to just hang out on the fringe borders of a few different styles. While that might describe some people’s worst nightmare – the idea of perpetual instability that is – the thought of a band forcing attention be paid to their music because it’s impossible for the music to meld into the existing sonic landscape, translates to one thing for sure: we mean business. 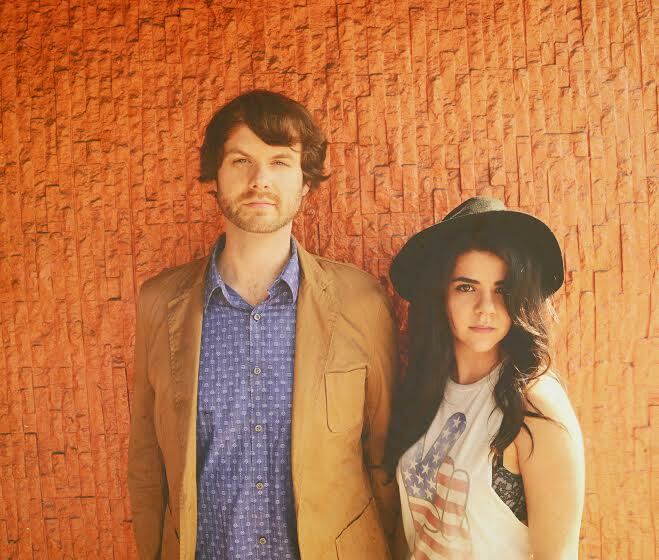 Madelynn Elyse and Peter Anthony of Polaris Rose undoubtedly mean business – whether or not they ever say so out loud. Pounding pavement in a musically popular place like Los Angeles is never easy. However, aside from having a lengthy repertoire, Polaris Rose’s sophisticated spin on power-pop lets their songs cut through the crowded scene with ease. Currently working on a second full length album (“Ocean Blue, Velvet Skies”), after already releasing three other works that include their debut LP and two EPs – all in less than three years time from their fall 2013 inception – speaks plenty for itself. “TigerBait,” the lead single from “Ocean Blue, Velvet Skies” recently made its way to the web and this record preview couldn’t be anymore enticing. The leading track mentioning and revolving around “bait” is a coincidence of amusingly pleasant proportions. If “TigerBait” is also one’s first introduction to Anthony and Elyse, the chances of multi-faceted intrigue are so high it’s almost scary. Starting with the unusual and gripping title, moving to the band’s delicate style of artwork and then diving into the song itself, each turn reveals a different dimension of expression that keeps one’s understanding of who Polaris Rose is, from ever fully settling –but never to the point of disjointed frustration. “TigerBait” does juggle lots of pieces: The steady, consistent chug of tightly layered guitars; an extremely catchy, synth driven melodic hook; lyrics that take on unexpected syllabic emphasis, thanks to syncopated rhythms (What I know / is tragically subjective / a three ringed show); a striking guitar solo and perfectly aligned vocal harmonies galore. Top that with interval and chord combinations – created by the vocal and instrumental parts together – which oscillate the track between singable major and dissonant minor, and this song might sound like compositional chaos. 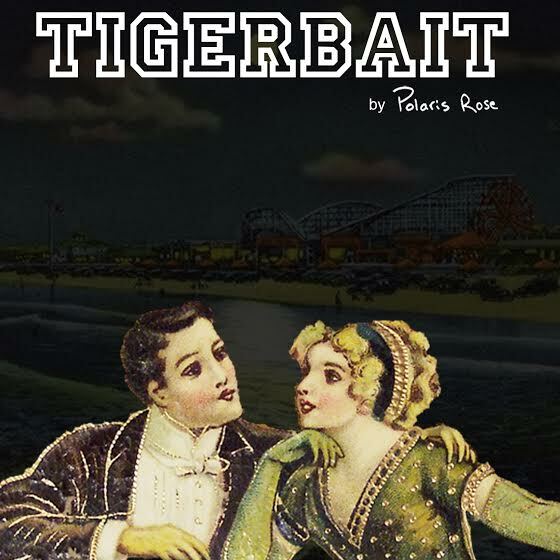 Yet, much like the intricate power-pop works assembled by Rivers Cuomo, Elyse and Anthony have shrewdly delegated each piece of TigerBait’s puzzle into something that is indeed wholly irresistible –in the best possible way. Amidst all the TigerBait flying about, Peter Anthony took the time to discuss many of the dimensions of Polaris Rose’s identity, the uncommon nature of the duo’s new single and – perhaps most exciting – the vision of an ambitious long-term project, for which he and Elyse are right in the throes of assembling! Kira: I’m sorry to say that I’m only hearing of you both now! This is definitely one of those, “Where have you been hiding all this time?” moments but, better late than never, right? That said, let’s talk about the sound of Polaris Rose. Classic, focused and tight power-pop is the first thing that came to my mind but, your lyrics and overall image project a slightly more sophisticated presence; perhaps less crazy and casual than the air of the power-pop genre might initially imply. What are some of the experiences or opinions that led to you shape your sound this way? Peter Anthony: Hey Kira! Polaris Rose is definitely the amalgamation of our personalities. I’m more the progressive rock type (Smashing Pumpkins, Failure, Steely Dan), whereas Maddie enjoys pop (Alanis Morrisette, Beyonce). Polaris Rose is our attempt to tightrope walk between the two. It’s funny to see people’s reactions to our music. Depending on the listener, we’re either too pop or not pop enough. We think it’s a good place to be, though. Kira: While I’m not going to flat out ask about your band name, there does seem to be a mild theme running through your name, EP/album and song titles. – one that refers to both the expanse of space and the depths of the sea. Might you elaborate on what speaks to you about these two extremes enough so that they recur in your discography? Anthony: There is a definite theme! We use all those metaphors in a Jungian way. We are aiming to complete a 6-album series that we’ve dreamt up, which uses the same metaphors and motifs throughout. It’s a bit dense to talk about, but hopefully (when the 6 albums are done) a couple of folks will be interested and we’ll be able to share our strange, metaphoric orchestrations. Kira: Fun and approachable as your new single, “TigerBait” might be, I can’t ignore the meticulous use of various rhythms and unusual melodic patterns in the song. (I hear that recurring augmented 4th!) What kind of relationship do you both have with music? Formal education, family exposure, lots of live shows? All of the above? Anthony: Wow, yeah, Maddie and I have both been chasing music as our passion since we were kids. We both focused on music in college and we’ve both played countless shows. We actually first met at a show out in Boston and we bonded over Michael Jackson’s “Rock with You”. That song still kills us. We are just big music fans with eclectic tastes. I’m listening to some opera while I type this. Ten minutes ago, I was listening to Alice in Chains. We try to expose ourselves to as much variety as possible. Kira: Bands each have their own set of priorities when it comes to developing themselves and growing their presence in the industry. The entity that is Polaris Rose comes across pretty well-balanced: You have plenty of recorded material but also play live often and you keep a fairly active level of engagement with fans through a nicely fleshed out image. Still, is there any particular aspect of the music business – touring, recording, getting your music out there via sync placement – that rings especially exciting and of priority to you guys as you prepare to mark down the next milestone of your second full-length? Anthony: We do our best to stay balanced… but we are definitely focused on the album-production end of things. In fact, I think sometimes we are too focused on it. I’m already demoing songs for the next record (part of that 6-album series I mentioned). We do our best to play just enough but not too much in LA. With ‘Ocean Blue, Velvet Skies’ we will be branching outside of LA much more. That being said, right from the start, we have really pushed ourselves to be savvy with the business side of things. Maddie really excels at the business side of things. I remember, before our first EP was even out, she had us interviewing with Greg [Allis] from Live High Five. We do our best to build lasting relationships with folks who are involved with music, whether that be bloggers, music supervisors, or passionate fans. It’s really a blessing that we’re able to do this band. We started this project because it’s what we love. We never expected the response we’ve been getting. Anthony: Thank you for the kind words! When we wrote ‘TigerBait’, we don’t think about synching. We wrote the song about our clickbait/buzzfeed culture and how two people are able to cut through the noise to agree that they don’t know anything about the world and are ok with that. It’s not a romantic story or anything like that. And we’re not trying to knock buzzfeed or anything like that, just chiding the people who take internet headlines as fact. ‘TigerBait’ was one of those songs that spilled out. It was there in full within 20 minutes or so. John Spiker – who mixed the record – mentioned to us that he thought the songs would be great for placements. We were surprised. When someone mentions placements, I think of more folk-oriented songs, like Mumford & Sons’. Not our wacky prog/pop/rock. Kira: Running my corner of the web all the way from New York, care to share a few things about the Los Angeles music scene – both in general and perhaps with the musicians themselves – that that make it unique from its east coast counterpart? Anthony: Well, I suppose LA and NY both have their stereotypes. We like both. From my own narrow perspective, Los Angeles has a lot of dreamers (like us) who get lost in that illustrious search for identity. Regardless, there are a phenomenal amount of talented people out where who are hard-working and amazing people. It’s inspiring to be in this city. New York is no different in that regard, it’s just a little more compressed. Kira: Similarly, what’s your favorite local spot to play? Why? Anthony: We love many of the venues out here but, Hotel Cafe has been good to us. Our CD release for our last album, “Telescopes” was a particular highlight. Great sound, great people, great ambiance, really well run. Kira: What are your favorite tools of the trade to use when you play shows? Any dream guitars/basses or pedals you’d love to take for a spin? Why? Anthony: Maddie has a beautiful seafoam-green jazz bass that her dad gave her. He played big band swing on it back in the 50’s. I play through a mesa mini-dual rectifier through either a Les Paul or a strat. Our real secret weapons (who make us sound good) are our drummers, Kiel Feher and Carlos Beltran. Whichever one of those guys we’re lucky enough to have on the kit, they hit hard and soulfully. Kira: Can you share some sonic “easter eggs” people might be able to listen for when “Ocean Blue, Velvet Skies” comes out? Are there any magic moments, unexpected notes, spontaneous quirks or otherwise that made it onto the record and what kind of studio anecdote is behind them? Anthony: We recorded 35+ songs for ‘Ocean Blue, Velvet Skies’. It was a long, gut-wrenching process. We eventually narrowed down the demos to 12 songs, but we were still frustrated. I was mixing the record at the time (I mixed our EP’s and ‘Telescopes’ as well) and it was just not sounding how we wanted it to. We basically gave up, feeling like our songs weren’t ‘modern enough’. Our plan was to just release a song or two and move on, writing and recording even more songs. On a whim, we passed along ‘TigerBait’ to John Spiker and asked him to mix.The moment we got his mix back, we were blown away and it totally turned us around. He brought up the keys in the background and made the whole track sound more modern. The next day, we were passing along the remaining songs. We loved his work so much. If not for his talent, this record may not have happened at all. Kira: Wrapping up with a bit of potpourri, I noticed your Harvard and Stone show poster from back in September features a twist on the iconic artwork from Neutral Milk Hotel’s “In the Aeroplane Over the Sea.” I take it you’re fans of the record? Anthony: A fan of ours pointed the similarities out to us. I designed the poster and have actually never heard the record. I’m about to throw it on now. “TigerBait” is available for free download now through the SoundCloud player above. Here’s to the hustle and ferocity of Feral Conservatives’ debut!